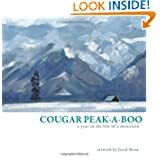 It is with great sadness that I have recently learned that an individual broke into my exhibit at the Missoula Art Museum, and stole one of the 365 paintings of Cougar Peak. Words cannot describe the tremendous amount of physical and mental endurance that went into creating this body of work. Never again shall I attempt a project of this magnitude, and to have it broken……well, it breaks my heart. The actions of this individual have not only hurt me, but unfortunately have created a great deal of difficulty for the museum, and the people that work there. An enormous amount of effort was put in by their staff to make the exhibit look as fantastic as it did. It was nothing but a pleasure and honor to have the opportunity to share these paintings with the public, and I was immensely gratified by the enthusiastic response that the show received from all ages and nationalities. As to the individual that has my painting, I’m flattered you found my work to be so moving, as to risk so much. If it truly means that much to you…..then by all means it’s yours. However you may find that in the end, whatever satisfaction you hoped to receive from my painting eludes your grasp, and what you are left with is only a deep feeling of emptiness. October 18th must hold a special meaning for you; I hope you still find it to be so. Nevertheless, I urge you to choose what is right, and return the painting……mostly for your sake, as well as for the sake of others. Just a reminder….my exhibit of all 365 Cougar Peak paintings at the Missoula Art Museum is coming to a close tomorrow. If you haven’t had the opportunity to check it out, or need one last peek…..tomorrow is your last chance.